Small cell lung cancer (SCLC) is very aggressive, as the cancer cells quickly grow and easily spread throughout the body. Often, SCLC can be diagnosed using several common tests, but has poor survival following metastasis. Now, researchers at Tokyo University of Agriculture and Technology (TUAT) in Japan have developed a simple technique to identify SCLC earlier. This work, published in the July issue of Analytical Chemistry, reports on nanopore technology combined with DNA computing technology to catch the early biomarkers for SCLC, which were two independent microRNAs. 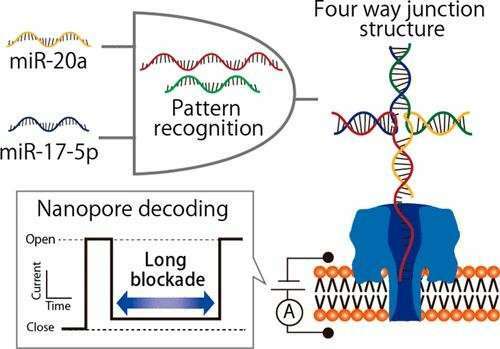 "DNA computing technology allows DNA molecules to autonomously recognize the pattern of microRNA molecules and to convey the information in the form of electric current generated," said senior author Dr. Ryuji Kawano, associate professor, Department of Biotechnology and Life Science, TUAT. Those microRNAs (miR-20a and miR-17-5p) are known to be the biomarkers for SCLC and are secreted in patients. "We designed diagnostic DNAs artificially and developed a nanopore device that independently recognized those microRNAs through microdroplets," said Dr. Kawano. The diagnostic DNAs recognized the two microRNAs and formed the complex structure of microRNA and diagnostic DNA autonomously (See Image). In the case of the both miR-20a and miR-17-5p are simultaneously present, or there is only one, or when neither exists, (1 1), (1 0) or (0 1), or (0 0), respectively, all different cases were discriminated by the duration of the blocking current signals without labeling. This measurement can be conducted around for 1 hour.